London Cypriot, Tonia Buxton, is a woman of many talents, keeping herself busy as a presenter, historian, writer, gourmet cook and beauty expert. And she balances it all with being a wife and mum to four children! 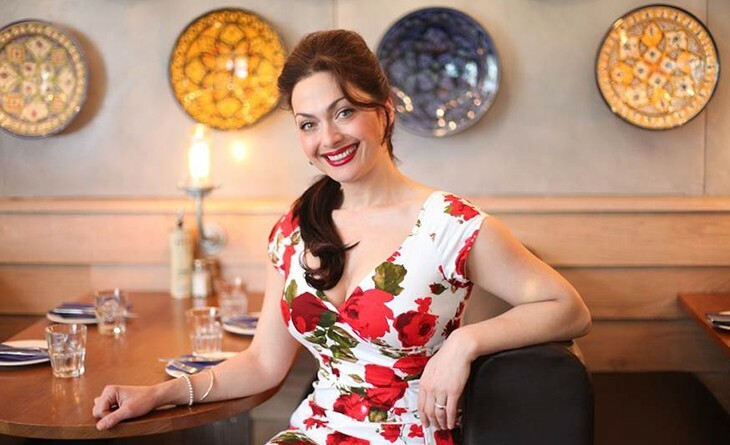 Presenter and producer of The Discovery Channel’s award winning My Greek Kitchen, the series was such a success that she went on to make series two of My Greek Kitchen with the follow up, My Cypriot Kitchen. It has since received global acclaim, shown in 17 different countries and airing again in the UK this October. Tonia is passionate about Greek food, inspired by her mother’s kitchen from a very young age, and believes Greek food is a big undiscovered secret! 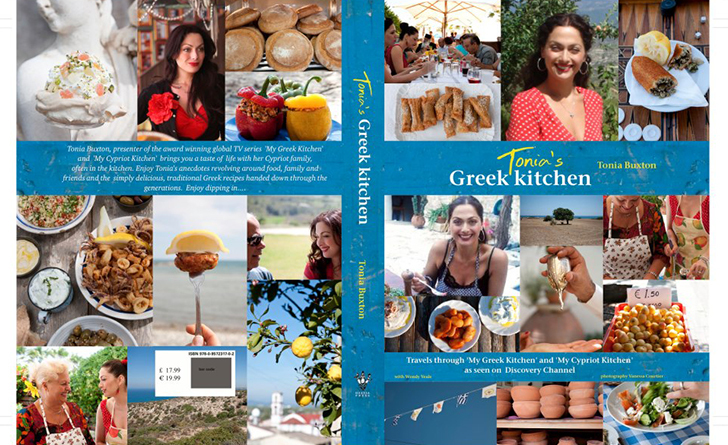 Having written on healthy eating and mood foods for years, she wrote her own Greek Cookery book, Tonia’s Greek Kitchen in October 2012. She is now very excited to be working with Blink Publishing on her second book Eat Greek For A week which will be out in June 2015. Her series Beauty and the Feast is also shown on ‘UK Food’, and around the world, while she is currently in talks with a major supermarket to develop her own signature food range. My Cyprus Insider asks her ten questions about her life in Cyprus which include long holidays ever since she was a young girl…read on! My family, the food and the weather. Gosh that is such a hard question to answer as I am constantly discovering new places in Cyprus that inspire me! At the moment I just adore what is happening in the old town of Nicosia, I love the art galleries that are popping up, and all the cafes and shops, I could just spend days wandering around and soaking up the atmosphere; it’s edgy and young. I do have to admit though that if I can escape and have a cocktail at the Koi bar in the Capo Bay hotel at sunset, it makes me very happy! 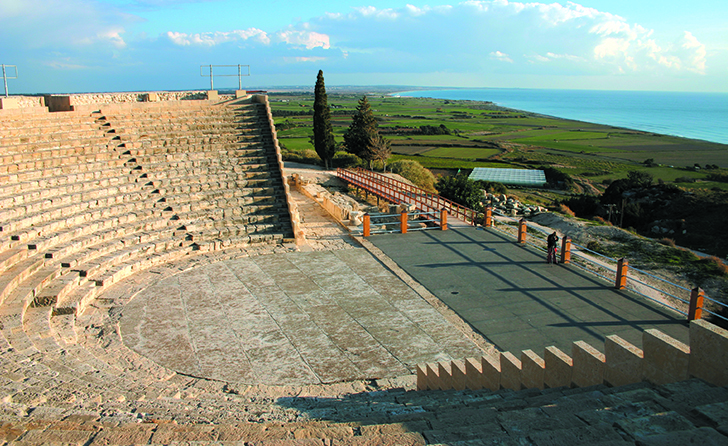 I am so very inspired by the amphitheatre at Curium, I am a wanna-be opera singer, one day I will pluck up the courage to sing an aria there. Your questions are impossible to answer because I cannot narrow it down to a single one! I adore Nicosia for its vibe, Lythrodontas as it’s full of memories for me growing up, and my family make the best rose water from the roses grown there: Kallonas Rodostema. 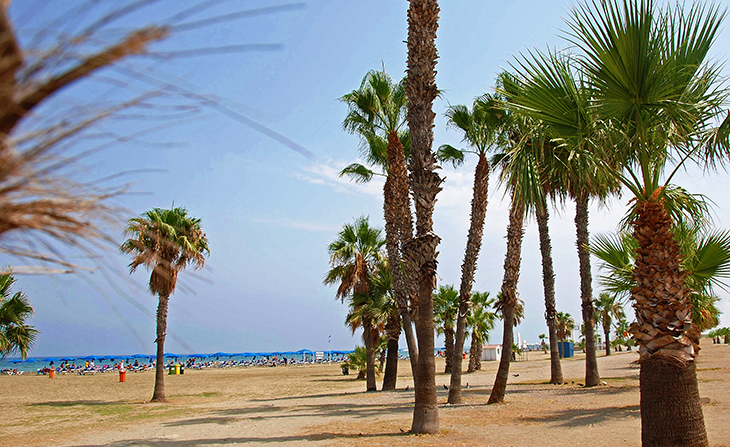 Then there’s Larnaca because we spend so much time there at my parents’ house on the beach – it’s so peaceful – and I can’t leave out Limassol because I am a child of the 80s! Cyprus is very much in my heart, and even though I am British born, it is somewhere I call home, my whole life is filled with memories on the island. One of my proudest memories is when I was filming series two of My Greek Kitchen and my camera man said that he had worked in many countries all over the world, but never had he come across hospitality like that of the Cypriots. 5. From sunrise to sunset, what’s your perfect weekend break? Being a working mother of four I very rarely get time to be still so my perfect day would be very lazy, sitting under an umbrella reading a book listening to the sea, only getting up to eat freshly caught fish at lunch time, then more relaxing, before I get brought a lovely cocktail to do more relaxing with. Then I would be brought a fresh pitta of souvlaki with sheftalia YUM!! 6. A day out at the mountains or beach? I do like the mountains for a day but I think I am more of a beach girl. Ok this is going to be long!!! I just love eating at my friend Roddy’s restaurant, Ta Piatakia in Limassol; he is great at modern Cypriot cuisine. 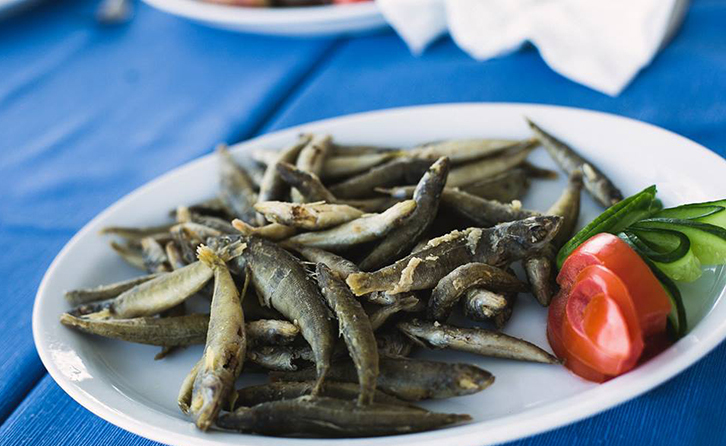 Zephyros fish tavern in Larnaca is just the best there is, literally fresh out of the sea! The Four Seasons Hotel has the best lunch buffet of any hotel on the island, everything is fresh, tasty and well thought out. Archontikon Papadopoulou in Kornos is somewhere I have a soft spot for, I think it’s such a lovely restaurant, beautifully renovated & their tava meze all baked in the clay ovens is lovely. I am always looking for new modern/different places to eat in Cyprus so if your readers have any suggestions I would love to hear them. They do wonderful cocktails at Ousia Lounge by the castle in Limassol, the Vista Terrace in The Four Seasons is a favourite of mine, but I am always looking for new places, so I would love to hear some suggestions. 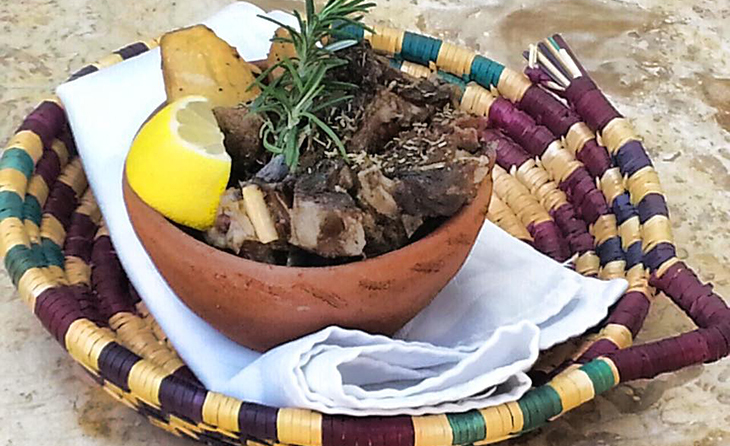 So I can cheat a bit here, I would recommend that they try the traditional Cypriot meze, I do however suggest that they do their homework and ask around to find a restaurant that does it really well, like Voreas in Oroklini village or Agia Anna in Agia Anna village in Larnaca. As I am a mother I always end up visiting during the school summer holidays which is great, but if I could, I would come to Cyprus in May or June: the flowers are still in bloom, the weather is wonderful and there is a freshness about the island that I adore.